Well the Xeric Xeriscope is certainly different and on first impressions I like it. Here you have a visible and unusual “Orbital” watch movement, which is available in various styles and has everything you need to see on the dial. The minute sub-dial is @12 and I find it rather unique as it uses a double ended pointer/hand of two different lengths, and as you follow the minutes round, the appropriate pointer indicates each minute on the segmented Minute index, which is really quite clever. Whilst the dial shows the time easily it is clearly a different style display that manages to be simple and efficient with little dial clutter. A Power Reserve indication is @10 and the Automatic movement gives around 50 hours when fully wound. 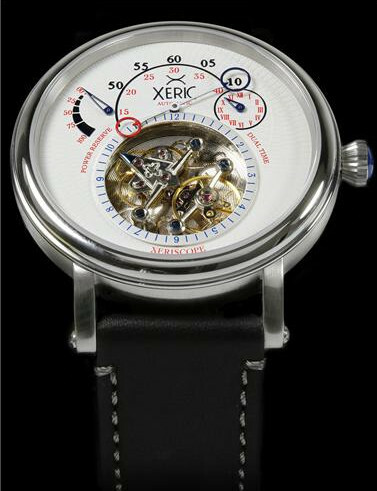 Being Automatic and mechanical it is powered by the wearer’s wrist movement using a conventional Automatic Rotor system. So a neat and modern complication watch, but with the addition of a unique Orbiting mechanical movement, which if I understand it correctly, moves basically as the Hour hand would do in a conventional watch, but in a sort of Tourbillon-esque manner. In the case of the Tourbillon however, the movement revolves 360º in 60 seconds as it precesses, and provides a fascinating “mobile” experience. But I like the conceptual look of the Xeric and coupled with the tricky minute hand/indication, is rather different and refreshing. The watch dimensions are 45 mm diameter x 13 mm height, a smooth edge top bezel and case in Stainless Steel. There is a porthole case-back with a mineral crystal so the movement and rotor can be seen from the rear. The crown is a large Onion style and is used to set both the main time and the dual time, the latter being set to whatever second time (hour) appropriate for your needs. The watch has a Water Resistance of 5 ATM or 50 m and has a lug width of 22 mm for the leather strap. Produced by Watchismo and sold direct by them on their web site – HERE. The model comes in various colors and styles, though for me and as regards clarity I prefer the one I’ve featured here, but of course is personal choice. Certainly a “something different” I would say and nice to see. . . .